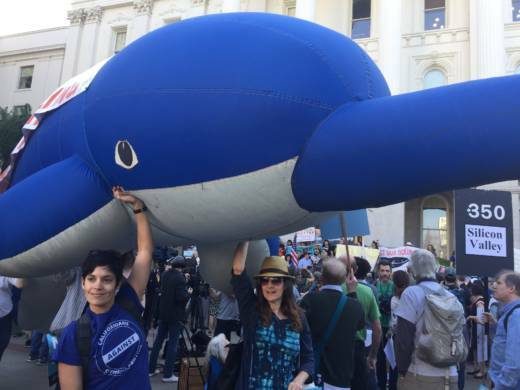 Several hundred protesters rallied at the state Capitol on Thursday to oppose a federal plan to expand drilling for oil and gas off California shores. If the plan, currently a draft proposal, is finalized, the U.S. Department of the Interior could begin selling leases to drillers as soon as next year. The protesters demonstrated before an event held by the Interior Department's Bureau of Ocean Energy Management; it was the federal government's only scheduled public meeting on the issue. The event, held at Sacramento's main library, was billed as an "open house." There was no opportunity for public comment; instead the department set up informational displays, with kiosks available to write comments. Still, protesters managed to get their voices heard, chanting "Where's the hearing?" and turning the event into something of a circus. 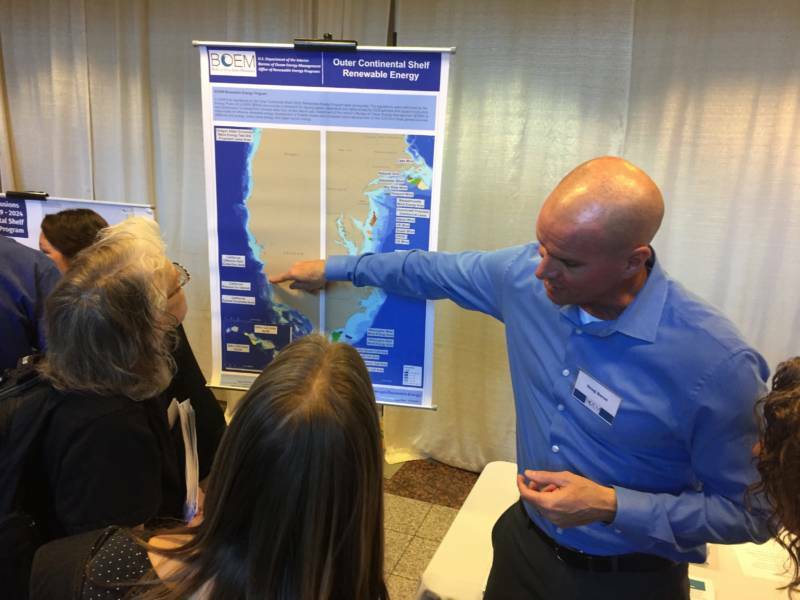 Bill Brown, the chief environmental officer with the Bureau of Ocean Energy Management, defended the meeting's format, saying it was a "more effective way to communicate." "I think there are plenty of legitimate environmental concerns to be addressed," he said. "The downside of the hearing thing is that you don’t get to talk to [or] really interact with folks. And also everyone needs to sit there, and they only get their two minutes in the sun, basically." Map from the federal Bureau of Ocean Energy Mgt. shows the "extent of geological plays" off California. Opponents of the Trump administration's plan are fearful of a catastrophic oil spill and burning more fossil fuels that drive global warming. "We're moving a lot more towards renewable energies," said protester Chase Wood, 25, a resident of Orange County and a Greenpeace activist. "There are more jobs in the energy sector than there is in all of the coal industry. We need to start moving on to the 21st century." Offshore drilling has been a hot-button issue in the state since 1969, when the blowout of an offshore well led to a catastrophic oil spill in the Santa Barbara Channel, fouling 35 miles of coastline. "I think people really recognize that offshore drilling for oil is a dirty and dangerous business," said Miyoko Sakashita, who directs the oceans program at the Center for Biological Diversity. "We've all seen the images of the oiled coasts and the oiled birds." California has banned new exploration in state waters within three miles of shore for decades, and the White House under Barack Obama added restrictions in federal waters. The Trump administration's 5-year plan calls for leases to once again be offered to oil and gas companies for exploration and production in nearly all U.S. waters. Proponents of offshore drilling also weighed in Thursday. Bob Poole, vice president of the Western States Petroleum Association, said the alternative to offshore drilling is importing oil from countries that lack environmental regulations. “We import more than a million barrels [of oil] every day, each and every day, over the ocean, from countries that a lot of whom don’t like us very much," he said on KQED's Forum radio program. "All of that oil is coming on on tankers, every day." He added, “If we’re going to need oil for the foreseeable future ... doesn’t it make sense to produce that oil rather than try to stop that — and produce it under the most stringent environmental regulations on the planet — instead of importing this oil in supertankers from countries like Saudi Arabia and others where they don’t have those rules?" Meanwhile, some state officials have begun moving to block newly produced offshore oil from being piped ashore by withholding permits. "I am resolved that not a single drop from Trump's new oil plan ever makes landfall in California," said Lt. Governor Gavin Newsom in a statement on behalf of the State Lands Commission, which he chairs. In January, State Senator Hannah-Beth Jackson (D-Santa Barbara) introduced SB 834, which would ban new pipelines, piers, wharves, or other infrastructure that would go through state waters. A similar bill died in committee last year. A companion bill, AB 1775, was introduced by Assemblymember Al Muratsuchi (D-Torrance). If passed, the legislation could potentially dissuade oil companies from buying oil leases. Without a pipeline to bring oil onshore, oil companies would have to turn to other means, like using ships for transport, which is generally seen as riskier and more expensive. Industry advocates have argued that because federal waters belong to the taxpayers, they should not be closed to drilling. Currently about 30 wells are in operation off of California, mostly in federal waters. Also on Thursday, the California Assembly overwhelmingly passed a resolution opposing the Trump administration's plan. The vote was 55-8. The Assembly also asked U.S. Interior Secretary Ryan Zinke to remove California from the proposed leasing plan. Assemblywoman Monique Limón, a Santa Monica Democrat who sought the resolution, cited previous offshore spills that have tarred the state's picturesque coastline. Republicans Randy Voepel of Santee and Travis Allen of Huntington Beach say oil and gas can be safely harvested. Allen, a GOP candidate for governor, says the move could help lower gasoline prices. Protesters in other states have already gathered to voice their displeasure at the planned reinstatement of offshore drilling. On Tuesday, more than 100 demonstrators gathered outside Oregon’s state Capitol in Salem to denounce the proposal before a planned public meeting.. Twenty-three meetings are scheduled nationwide, one in every state except Hawaii that touches the Atlantic or Pacific oceans. Comments can also be submitted online through March 9. Craig Miller, Amel Ahmed, Jon Brooks, Lauren Sommer and the Associated Press contributed to this post.